Fleetwood Mac can actually remember the idealism which spawned 1969’s original Isle of Wight festival. But the catastrophic marriage collapses and cocaine mountains which catalysed the classic Rumours, an album which they no longer try to live down, meant they embodied the Seventies far more. So while their Sunday headline set taps into this festival’s founding traditions, they play the smoother, harder rock of later, and far more cynical times. Dr Showbiz has cured the unnamed ailment which cancelled two UK shows in the nervous run-up, letting them at least make it on stage, as they were always somehow going to. A bounding Mick Fleetwood is first, arms aloft in premature triumph. He is the pounding, insistent motor, musically and personally, without which the band he co-founded in 1967 would sputter and die. Stevie Nicks and Lindsey Buckingham, by contrast, show steely determination. Buckingham, the band’s Brian Wilson-like songwriting mastermind since 1974, looks faintly above a band he has tried to put behind him many times, as if he’s too old for this foolishness. But he gruffly leads the charge with “The Chain”, the charge of hearing its great, bass-heavy riff electrifying the huge crowd. Few have headed for the ferries with Fleetwood Mac in town. The band’s secret, only recently returned weapon, Christine McVie dominates the early, Anglo-Californian harmonies; the English purity of her voice raises the band above the soured innocence which spawned Rumours. When all their voices join in hippie harmony on that album’s “Dreams”, for a moment the AOR sluggishness and personal battles which have dogged them fade away. 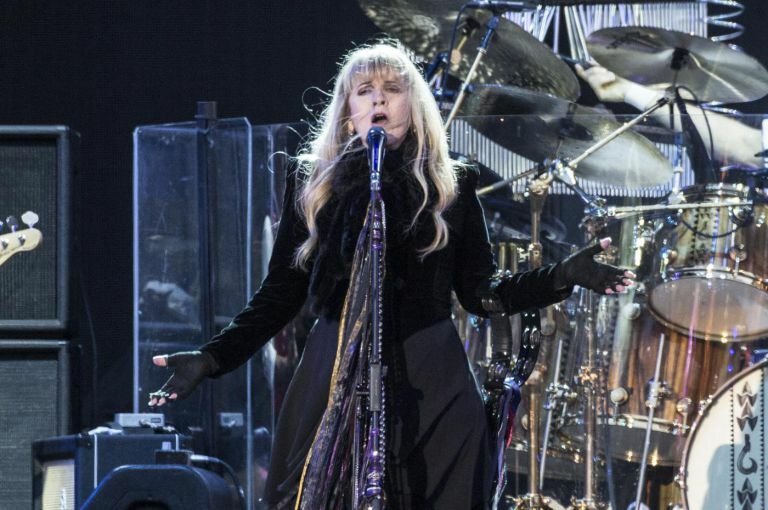 Fleetwood Mac managed to do the impossible at Isle of Wight: top Blur's performance from the previous night, says Patrick Smith. If any act were to top Blur's glorious Saturday-night set, it would surely be folk-rock behemoths Fleetwood Mac. And so it proved, as the sun went down on what's been the best Isle of Wight festival in years, overflowing with nostalgia thanks to its affectionate nod to the 45th anniversary of Jimi Hendrix's famous performance here. Weary bodies, battered by rain on the Friday night, hauled themselves to the Main Stage to witness the American-English quintet, who seemed to have shrugged off the illness that forced them to cancel their Birmingham and Manchester gigs earlier in the week. It was marvellous to behold. Making their first ever appearance at Isle of Wight, this volatile soap opera of a group are now restored to their original configuration, with singer-pianist Christine McVie returning after a 16-year hiatus. That they were here to close proceedings represented a major coup for the festival – especially when you consider Michael Eavis has been trying to sign them up for Glastonbury for ages. The Mac, now in their 48th year and in the middle of a 130-leg reunion tour, opened with the familiar driving riff of The Chain, which saw thunderous drums, coruscating guitar lines and sweeping melodies collide to devastating effect, while its chorus of, "we will never break the chain," felt rather apt. From there the hits kept coming. Vocalists Stevie Nicks, Lindsey Buckingham and McVie, each dressed in black, all shared the limelight willingly, with the former's voice, admittedly less honey-toned than it once was, anchoring the beautiful Dreams, taken from their 1977 break-up album Rumours. "Welcome back Mrs Christine McVie," said a Nicks in one of many heartening showings of camaraderie. Everywhere, their gorgeous, twinkling ode to all-encompassing love, soon followed, with McVie taking centre stage and providing one of the high points of the festival. Later, Buckingham stressed the importance of change, before a virtuosic performance of 1987's Big Love. How pleasing that the brilliance of Fleetwood Mac's music hasn't changed. Earlier, in a packed-out Big Top tent, The Lightning Seeds, fresh from their appearance on TFI Friday on Friday night, were by turns wistful and energetic. Spearheaded by their charismatic frontman Ian Broudie, the Liverpudlian alt-rockers, who formed in 1989, began their 50-minute set with Sense. But it wasn't until a polished rendition of The Life of Riley, a song synonymous with Match of the Day's Goal of the Month segment in the Nineties, that the audience began to embrace them fully. Because of the phenomenal success of Three Lions, the football anthem made with comedians Frank Skinner and David Baddiel for Euro '96 and rejigged for the 1998 World Cup, it's easy to forget that, in their pomp, Lightning Seeds were actually pretty inventive, purveyors of catchy, fey pop songs such as their 1990 track Pure which closed their set to grateful applause. Demands for Three Lions, meanwhile, were kept to a minimum – a good thing really, given that it didn't make the cut.